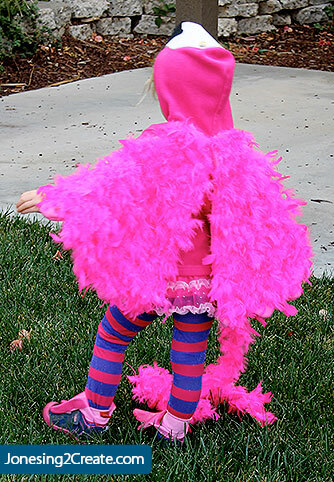 For Halloween this year my little girl wanted to be the pinkest thing she could think of – a flamingo! 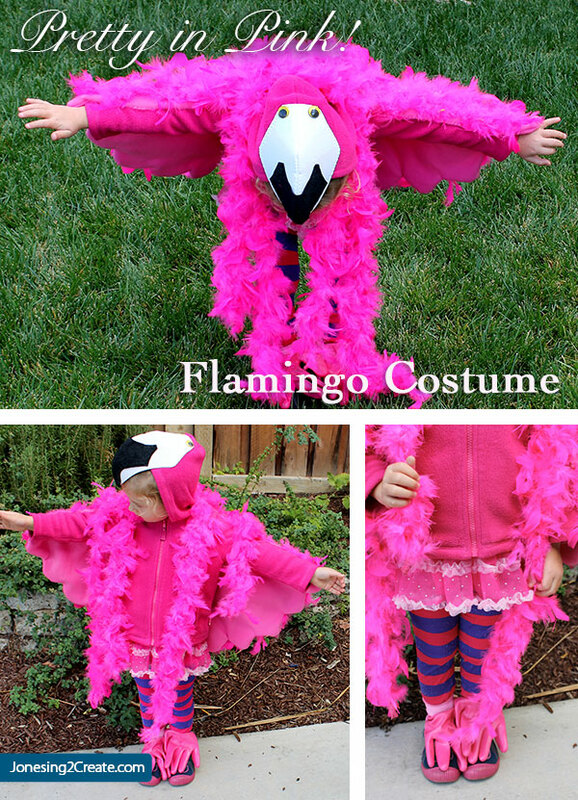 I decided to cheat and instead of making it from scratch, I made the flamingo costume by repurposing a pink sweatshirt she was just about to grow out of and a shirt that had a cute little bright pink skirt on it. 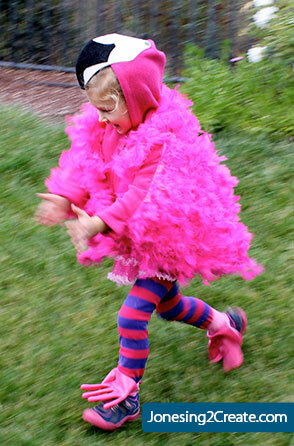 I made the wings using fleece and some feather boas I picked up at Dollar Tree. 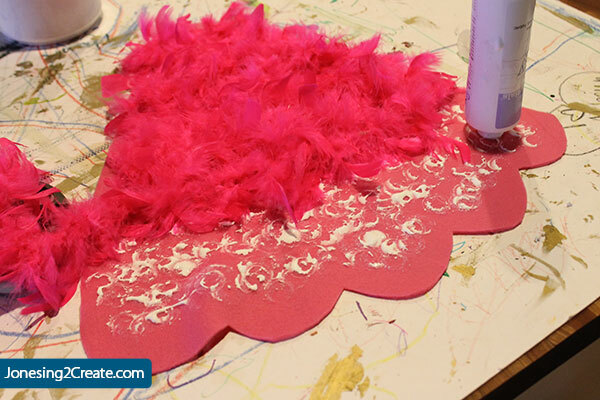 I first glued the boas on using craft glue. 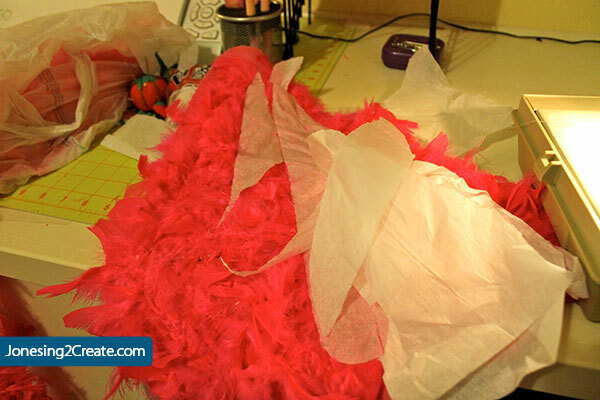 When I tried to sew over the feathers, the feathers kept getting wrapped around my sewing machine’s foot. 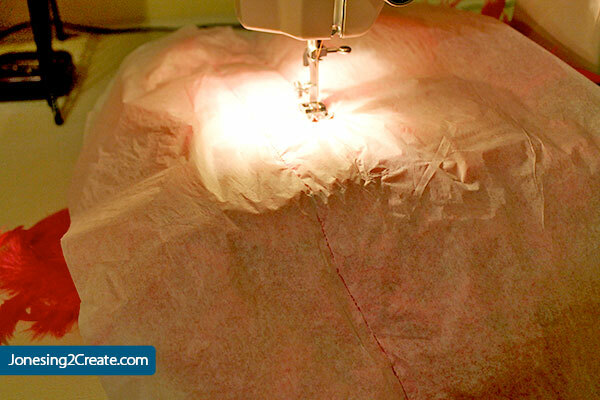 So I finally took some tissue and sewed over that. After I was done I just tore the tissue off. It worked like a charm! 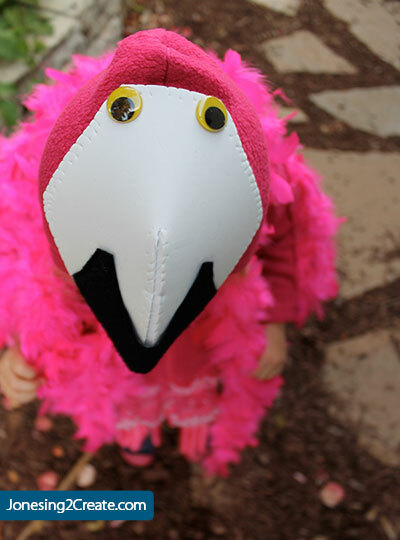 You don’t have to sew over the feathers after you glue them, but I noticed that they stayed on a lot better. You don’t want your bird to molt! I sketched this for the pattern for the wings. Once the wings were put together, I hand stitched them to the arms and the back of the jacket. 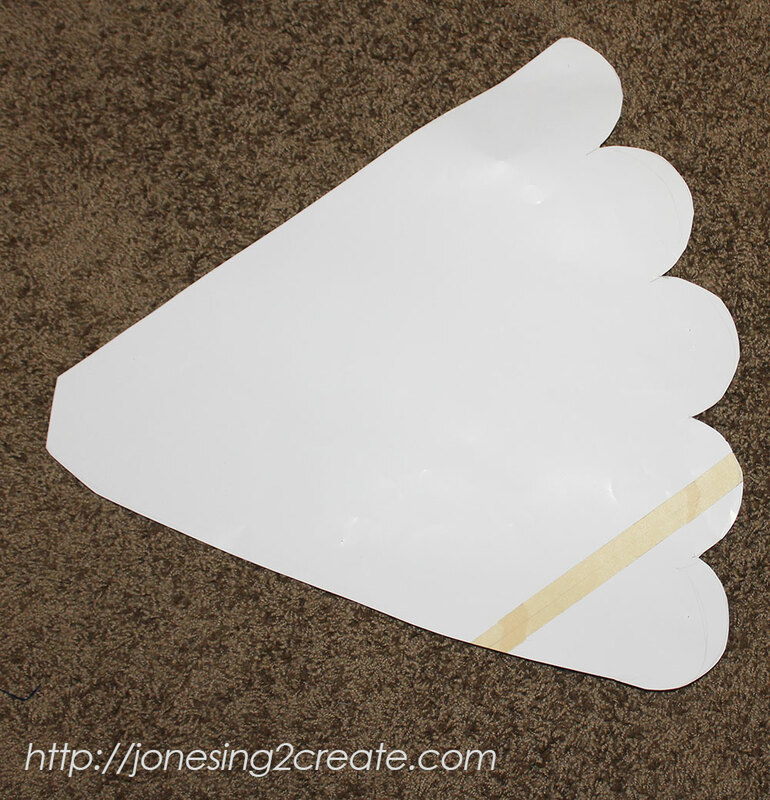 For the flamingo beak I used white craft foam and black felt. 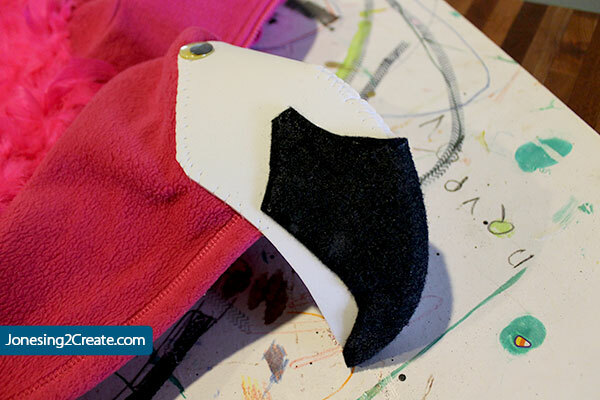 I hand stiched the foam together and to the jacket hood, but I glued the felt onto the beak. But I noticed that the glue came through the felt and looked kind of funny. So I painted over it with black fabric paint. I ended up liking it loads better because it made the flamingo beak look more shiny. 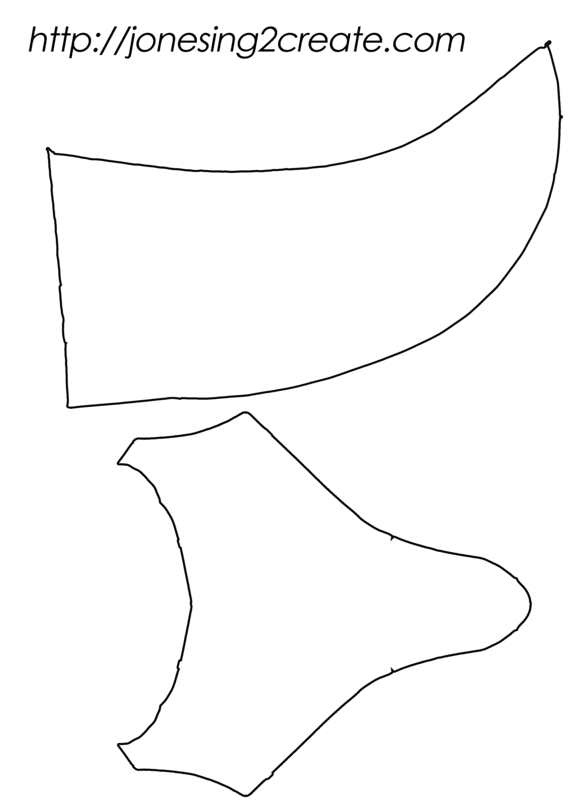 This is what I sketched as the pattern. For the feet I used some gardening gloves I found for cheap. And I bought some child’s tights at the 99 Cent Store for the legs. In all, it only cost $13 to make and it only took a few hours! And most importantly my little girl loves it! Whenever I make a costume I always make sure it is going to be comfortable to wear. My little girl is like me and she doesn’t believe that anything is worth being uncomfortable for! And what mom wants to put her heart and soul into a costume her kid won’t wear? 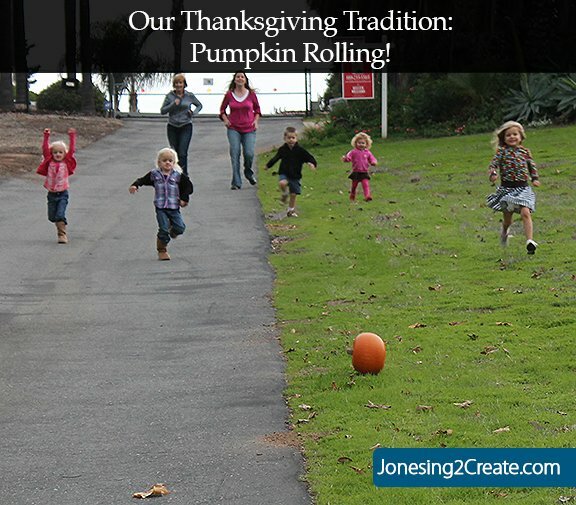 Pumpkin Bowling or Pumpkin Rolling? They are all so pretty. I think you’ve inspired me!